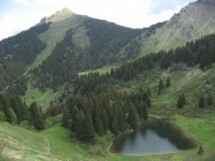 Sunday, July 17, I organize a hike to the 'Pic de la Corne' in the Chablais massif. The summit overlooks the valleys that surround it. But mostly it offers a wide and magnificent view over Léman Lake. The tour begins at Mont d’Evian (St Jean d'Aulps on the road Thonon to Morzine). It passes through the mountains of Brion and lake of Damoz des Moulins. Passing through the flowering fields and steep ridges, we will then reach the summit. To return, we will go down to the Lake and take the Fours trail to the car park. This course do not have technical difficulties. A gradient of 1200 m and a distance of 14 km. Walking time: about 5 hours.